Here's a cliche among digital marketers: Search engine optimization (SEO) isn't what it used to be. Here's a true statement you don't hear as often: Your SEO strategy for 2019 shouldn't focus on keywords. These days, most businesses understand the basic concepts of SEO and why it's important. 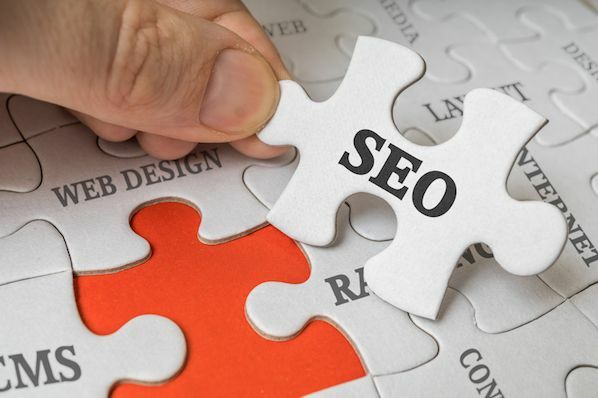 However, when it comes to developing and executing a sound SEO strategy for your business, just creating content for the keywords your customers are searching for is both arduous and, well, wrong. SEO strategy is the process of organizing a website's content by topic, which helps search engines like Google understand a user's intent when searching. By optimizing a web page around topics, then keywords within that topic, you can increase your expertise in the eyes of a search engine and rank well for long-tail keywords related to that topic. Search engine optimizers (SEOs) are people who optimize websites to help them show up higher on search engines and gain more "organic traffic." 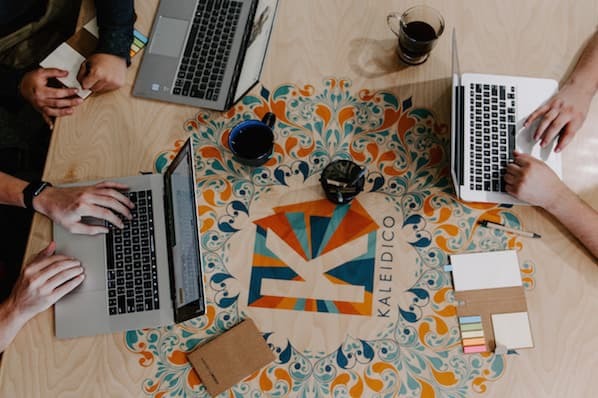 In essence, an SEO is a highly specialized content strategist, and helps a business discover opportunities to answer questions people have about the industry via search engines. On-page SEO: This SEO focuses on the content that's "on the page," and how to optimize that content to help boost the website's ranking for specific keywords. Off-page SEO: This SEO focuses on the links that are directing to the website from elsewhere on the internet. The number of "backlinks," and the publishers carrying those links, that link to your website help you build trust in the eyes of a search engine. This causes your website to rank higher as a result. Technical SEO: This SEO focuses on a website's architecture, examining the backend of that website to see how each webpage is "technically" set up. Google cares as much about the code of a website as it does its content, making this speciality quite important to a website's search engine ranking. Bear in mind that not every business can optimize their website for search the same way, and therefore not every SEO will have the same optimization process. It's an SEO's job to examine his or her industry, find out what's important to their audience, and develop an SEO strategy that puts the right content in front of that audience. With that in mind, here are nine steps you can take to make sure all of your SEO bases are covered in 2019. Then, at the bottom of this blog post, you can grab your free planning template to master on-page SEO. Make a list of topics. Make a list of long-tail keywords based on these topics. 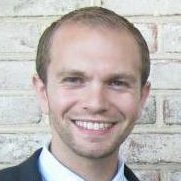 Build pages for each topic. Blog every week to develop page authority. Compress all media before putting it on your website. Stay current on SEO news & practices. Measure and track your content's success. Keywords are at the heart of SEO, but they're actually not your first step to an organic growth play anymore. Your first step is to make a list of topics you'd like to cover from one month to the next. To start, compile a list of about 10 short words and terms associated with your product or service. Use Google's Keyword Tool to identify their search volume and come up with variations that make sense for your business. You are associating these topics with popular short-tail keywords, as you can tell, but you're not dedicating individual blog posts to these keywords. These keywords are simply too competitive to rank highly for on Google if you're just starting to optimize your website for search. We'll go over how to use these topics in just a minute. Using search volume and competition as your measure, narrow down your list to 10-15 short-tail keywords that are important to you, and that people within your audience are searching for. 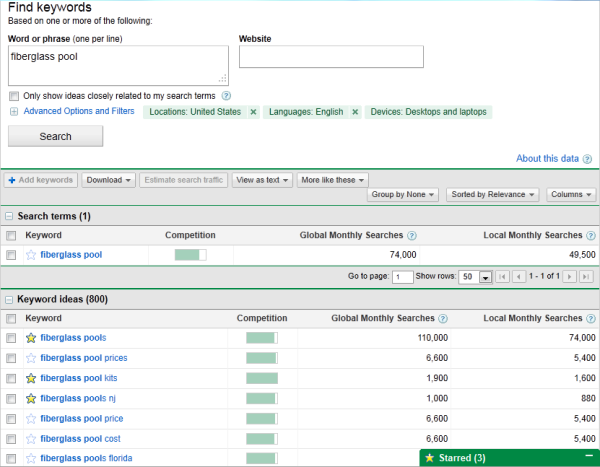 Then rank this list in order of priority, based on its monthly search volume and its relevance to your business. For example, if a swimming pool business is trying to rank for "fiberglass pools" -- which is receiving 110,000 searches per month -- this short-tail keyword can be the one that represents the overarching topic on which they want to create content. The business would then identify a series of long-tail keywords that relate to this short-tail keyword, have reasonable monthly search volume, and help to elaborate on the topic of fiberglass pools. We'll talk more about these long-tails in the next step of this process. 2. Make a list of long-tail keywords based on these topics. Here's where you'll start optimizing your pages for specific keywords. For each pillar you've identified, use your keyword tool to identify five to 10 long-tail keywords that dig deeper into the original topic keyword. For example, we regularly create content on the topic of "SEO," but it's still very difficult to rank well on Google for such a popular topic on this acronym alone. We also risk competing with our own content by creating multiple pages that are all targeting the exact same keyword -- and potentially the same search engine results page (SERP). Therefore, we also create content on conducting keyword research, optimizing images for search engines, creating an SEO strategy (which you're reading right now), and other subtopics within SEO. This allows a business to attract people who have varying interests in and concerns about owning their product -- and ultimately create more entry points for people who are interested in buying something. Use subtopics to come up with blog post or webpage ideas that explain a specific concept within each larger topic you identified in Step 1. Plug these subtopics into your keyword research tool to identify long-tail keywords on which to base each blog post. Together, these subtopics create a cluster. So, if you have 10 pillar topics, they should each be prepared to support one cluster of five to 10 subtopics. This SEO model is called a "topic cluster," and modern search engine algorithms depend on them to connect users with the information they're looking for. Think of it this way: The more specific your content, the more specific the needs of your audience are -- and the more likely you'll convert this traffic into leads. This is how Google finds value in the websites it crawls; the pages that dig into the interworkings of a general topic are seen as the best answer to a person's query, and will rank higher. 3. Build pages for each topic. Take the 10 pillar topics you came up with in Step 1 and create a web page for each one that outlines the topic at a high level -- using the long-tail keywords you came up with for each cluster in Step 2. A pillar page on SEO, for example, can describe SEO in brief sections that introduce keyword research, image optimization, SEO strategy, and other subtopics as they are identified. Think of each pillar page as a table of contents, where you're briefing your readers on subtopics you'll elaborate on in blog posts. Use your keyword list to determine how many different pillar pages you should create. Ultimately, the number of topics for which you create pillar pages should coincide with how many different products, offerings, and locations your business has. This will make it much easier for your prospects and customers to find you in search engines no matter what keywords they use. Each web page needs to include relevant content for your prospects and customers and should include pictures and links to pages on your site to enhance the user experience. We'll talk about those links in Step 4. Blogging can be an incredible way to rank for keywords and engage your website's users. After all, every blog post is a new web page that gives you another chance to rank in search engines. If your business does not already have a blog, set one up. This is where you'll elaborate on each subtopic and actually start showing up on Google. First, don't include your long-tail keyword more than three or four times throughout the page. Google doesn't consider exact keyword matches as often as it used to. In fact, too many instances of your keyword can be a red flag to search engines that you're "keyword stuffing." This can penalize your website and drop your rank. Second, link out to the pillar page you created on this topic. You can do this in the form of tags in your content management system (CMS), or as basic anchor text in the body of the article. Once you publish each blog post, link into it from the pillar page that supports this subtopic. Find the point in your pillar page that introduces this blog's subtopic, and link it here. By connecting both the pillar and the cluster in this way, you're telling Google there's a relationship between the long-tail keyword and the overarching topic you're trying to rank for. 5. Blog every week to develop page authority. Not every blog post or web page you write needs to belong to a topic cluster. There's also value in writing about tangential topics your customers care about in order to give your website authority in the eyes of Google. This will cue Google to pay extra attention your domain as you add content to your primary topics. With that in mind, make a point to blog at least once a week. Remember, you are blogging primarily for your audience, not the search engines. Write about things your audience and/or prospects are interested in, make sure you're including relevant keywords where appropriate, and your audience will slowly start to notice and click. Keep in mind that each topic won't be equal in importance, and as your clusters get off the ground, you'll need to prioritize based on your company's needs. So, create a list of all the different web pages you would like to create and rank them. Then, develop a schedule and devise a plan of attack to get those pages built. Keep your list updated and prioritized by what web pages will help you to best achieve your business goals. 6. Create a link-building plan. The topic cluster model is your way forward in SEO this year, but it's not the only way to get your website content to rank higher once it's been created. Our first five steps were dedicated to on-page SEO tactics. Link-building is the primary objective of off-page SEO, and is also a huge factor in how search engines rank your web pages. What is link-building? Glad you asked. Link-building is the process of attracting inbound links (also called "backlinks") to your website from elsewhere on the web. As a general rule, the more page authority the origin website has, the bigger affect it will have on the rank of the web page to which it is linking. Dedicate some time to brainstorm all the different ways you can attract inbound links to your website. Start small –- maybe share your links with other local businesses in exchange for links to their sites. Write a few blog posts and share them on Twitter, Facebook, Google+, and LinkedIn. Consider approaching other bloggers for guest blogging opportunities through which you can link back to your website. Another great way to attract inbound links is to use your blog to post articles related to current events or news. That way, you have shot of getting linked to from an industry influencer or other bloggers in your industry. 7. Compress all media before putting it on your website. This is a small but important step in the SEO process. As your blog or website grows, you'll undoubtedly have more images, videos, and related media to host there. These visual assets can help retain your visitors' attention, but it's easy to forget these assets are still technically computer files -- and computer files have file sizes. As a general rule, the bigger the file size, the harder it is for an internet browser to render your website. And it just so happens that page speed is one of the most important ranking factors when search engines decide where to place your content in its index. So, the smaller the file size, the faster your website will load, and the higher you can rank on Google as a result. But how do you shrink a file size once it's on your computer? If you're looking to upload an image to a blog post, for example, examine the file for its file size first. If it's anywhere in megabyte (MB) territory, even just 1 MB, it's a good idea to use an image compression tool to reduce the file size before uploading it to your blog. Sites like TinyPNG make it easy to compress images in bulk, while Google's very own Squoosh has been known to shrink image file sizes to microscopic levels. Ultimately, keeping your files in the kilobytes (KB) can sufficiently protect your website's page speed. Be careful when compressing your images, and check the file's actual size once you export it back to your computer. While some tools might not be true to the size it shows you, others can sacrifice some image quality when compressing the artwork. 8. Stay current on SEO news & practices. Like the overall marketing landscape, the search engine space is ever-evolving. 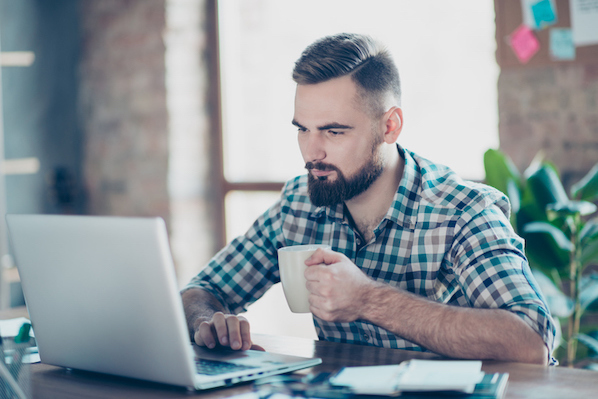 Staying on top of current trends and best practices is a difficult task, but there are multiple online resources that can make it easy for you to stay on top of SEO news and changes that may impact your website and your SEO strategy. 9. Measure and track your content's success. SEO can take a lot of time and effort. What good is spending all this time and effort if you can't see the fruits of your labor? There are many metrics you can track on a daily, weekly, or monthly basis to keep your SEO plan on track and measure your success. Because the metric you care about is organic traffic (traffic that comes from a given search engine), seek out a tool that allows you to track both your overall organic traffic number and how your pages are ranking under each long-tail keyword your pages are targeting. SEMrush is a great reporting tool for just this purpose. Create a monthly dashboard using Excel, Google Sheets, or a web analytics package so you can monitor how much traffic comes to your website from organic search. Also, tracking indexed pages, leads, ROI, inbound links, keywords, and your actual ranking on SERPs (search engine results pages) can help you recognize your success as well as identify areas of opportunity. Domain Authority in SEO is a number value, used by several keyword research tools, that measures how popular and trustworthy search engines see your website. It is calculated based on how websites link to each other on the world wide web. An SEO specialist is someone who is an expert on the topic of search engine optimization. They specialize in the optimization of websites to increase the number of visits they gain from search engines. What does an SEO executive do? An SEO Executive optimizes websites to make them show up higher on search engines and gain more website visitors. They work on off-page and on-page SEO. What is an SEO content writer? An SEO Content Writer is someone who writes content for the purpose of having it show up on search engines and gain website visitors. They are generally knowledgeable in the are of both SEO and content marketing. What Is the Job of a SEO? The job of an SEO is to manage the optimization of websites to ensure they gain website traffic from search engines such as Google & Bing. How do I become an SEO specialist? To become an SEO specialist, you can study marketing in university or online and/or gain practical experience in optimizing websites. Between on-page SEO, off-page SEO, and technical SEO, there are numerous ways to optimize a website so it ranks for the topics that are important to the publisher.